Included in the ‘in-the-water’ survey is a comprehensive inspection of the accessible areas of the hull and deck structure. Small panels will be removed, where easy access is possible, to inspect both the hull & deck. No destructive testing or dismantling of cabinetry or equipment is undertaken. All systems and equipment are inspected, documented and operated, where possible. Remarks will be made in the report if certain equipment is not tested due to circumstances at the time of the survey. Water tanks, hatches, ports and windows are tested for leaks when dockside water facilities are available. A full inventory is not taken during the survey, however all safety equipment is checked and documented. Inventory is normally checked at the time of acceptance by the owner or owner’s representative. The vessel is inspected during a short ‘lunch time’ haulout’. This cost is not included in the quoted survey fee. At Nanny Cay Resort & Marina, on Tortola, this haulout fee is $6.65/ft for small monohulls and $9.70/ft for multihulls & large monohulls. If the hull is badly fouled there will be an additional power washing cost. For further details please check - www.nannycay.com/boatyard-rates/. Haulout charges should be paid directly to the boatyard with a credit card at the time of the haulout. The wetted surface area of the hull is inspected for osmotic blistering, damage and repair work. The keel, drive gear, rudders and through hull fittings are also inspected at this time. The hull is inspected for blisters when it is in a wet state, shortly after being hauled or power washed. Any osmotic blistering will be easier to detect at this stage. A thick build-up of antifouling paint could however make the detection of small blisters difficult. Moisture meter readings of the wetted surface area of the hull are not possible during the ‘short haulout’ as the bottom paint retains moisture offsetting any readings taken. A sounding of the wetted surface of the hull is undertaken to help determine if any delamination exists in the hull structure. A visual inspection of the standing rigging is done at deck level and aloft. The age of the standing rigging, its design, material and its general condition is taken into account when making recommendations. The surveyor will be looking for corrosion, broken wires and cracks in the mast, spreaders, rigging terminals, swages, toggles and chainplates. Joints in the mast, repairs, the attachment of spreaders, masthead equipment and navigation lights are inspected. No dismantling of equipment takes place. The ‘cold head’ terminals associated with rod rigging, rigging covered with plastic, furling gear foils & drums and encapsulated or inaccessible chainplates, are areas not accessible for inspection. These areas should be inspected periodically as general preventative maintenance items. 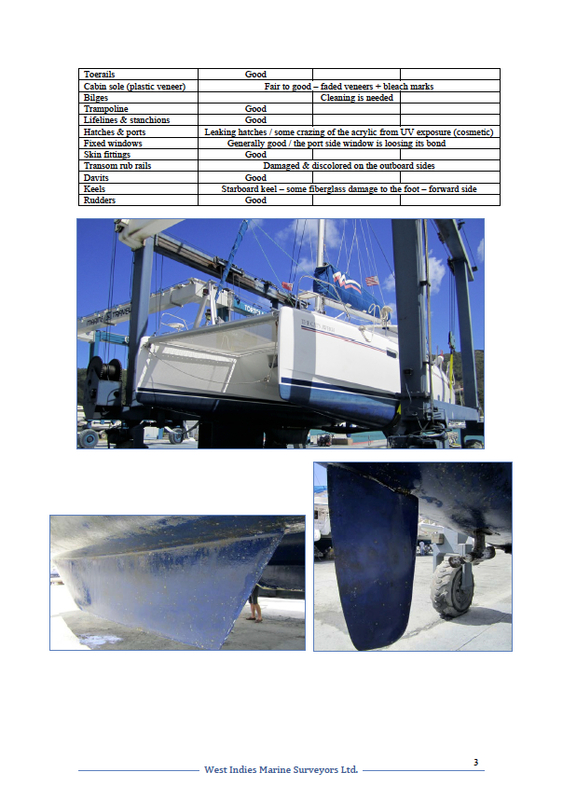 If maintenance records are not available, the buyer or owner of the vessel should take appropriate steps to have these areas inspected to verify the integrity of the mast and rigging. A sea trial is completed under sail and power, when possible. The machinery and drive gear are tested under loaded conditions. The manufacturer, age and engine hours are taken into consideration when making comments. 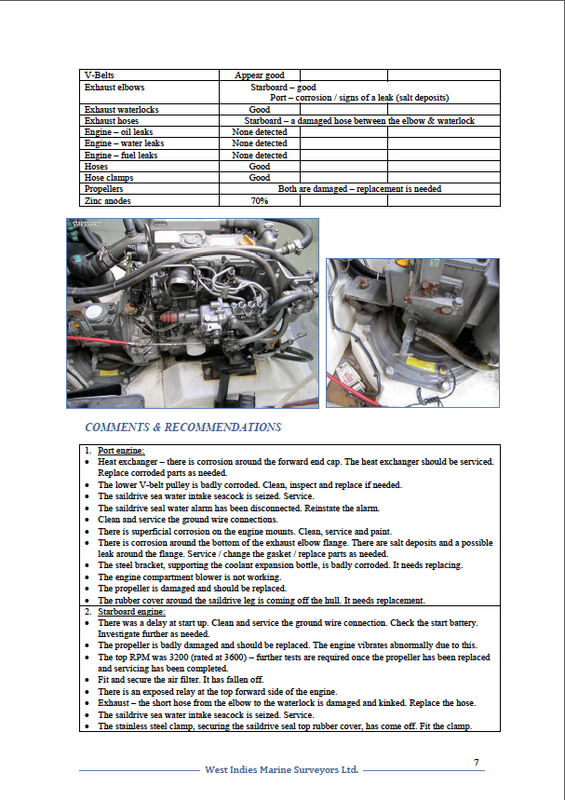 The engine survey is a visual inspection of the engines in static and loaded conditions. There will be a general inspection of the engine and associated equipment. Comments will include surface corrosion, coolant, fuel & oil levels and condition, detected leaks, abnormal noises, vibrations and emissions, engine mounts, fitted compressors & alternators, hoses, V-belts, the gearbox, shaft couplings, alignment, stuffing boxes / shaft seals, control cables and wiring. The vessel will be sailed, when possible, to enable the surveyor to inspect the deck hardware under load and to inspect the general condition of the sails. Spinnakers and storm sails are not normally rigged for inspection during the sea trial. A comprehensive report will be a PDF file with colour digital photos and will be e-mailed to you within 36 hours of completion of the survey, when possible. The size of an average report will be approximately 1.5MB. The survey report is for your personal use and will not be forwarded to any third parties without your approval. Our staff will endeavour to be as thorough and accurate as possible. If third party opinions or services are required (compression tests on machinery, oil sampling etc.) we will be happy to help organise these services. Please let us know when you initially negotiate our surveying services, if you would like a ‘Follow-up Inspection’ once agreed repairs are completed. Our surveyors frequently travel and we would like to ensure that a surveyor is available before we offer you this service. If requested, we will complete a final check off on repairs before you accept the vessel. We will issue a sign-off document for Insurance / Financing use. For Insurance coverage, you as the insured can sign compliance on ‘Recommendations’ listed in the survey report and you might want to decline our Follow up service. We recommend that you or your representative is present at the time of acceptance of the vessel.